from the Medicare trust fund? After stealing that money, did he spend it on Obamacare? Question #1 is pretty easy: No he didn’t. 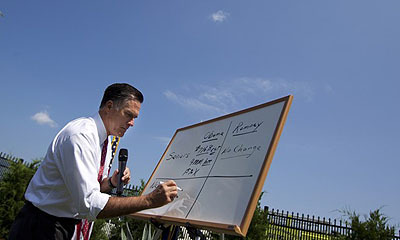 Mitt Romney has been peddling this wacky charge for the past week, and it’s a strikingly ignorant claim. Slightly longer answer: Money that’s paid into the Medicare system — which comes mainly from payroll taxes, premiums, and general revenue — goes into Medicare’s two trust funds. Money that’s paid out to doctors and hospitals comes out of the trust funds. So there are only two ways you could “rob” money from the trust funds: you could reduce taxes going in or you could increase money being paid out. Obamacare does neither of these things. In fact, it reduces reimbursement rates to hospitals, which means that it improves the financial health of the trust funds because less money is flowing out. In particular, after Obamacare was signed into law in 2010, the Medicare trustees estimated that it had extended the life of the HI trust fund by 12 years. So why is Romney saying this? Beats me. I guess his team decided that “taking money from the Medicare trust fund” sounded more heinous than “reducing spending on Medicare.” The latter actually has the virtue of being true, but that doesn’t count for much these days. Question #2 is actually a little trickier. It’s unquestionably true that Obamacare reduces spending on Medicare, which allows us to spend more on Obamacare without changing our overall budget level. But does that mean we’re taking money from Medicare to spend on Obamacare? Here’s an analogy. Suppose I have income of $100 per month, and I normally spend $50 on rent and $50 on food. Then I negotiate a lower rent with my landlord. Now I spend $45 on rent and $55 on food. Did I take money from the rent to spend on food? I’d say no: I still have the same apartment, after all, and it’s not as if I’m going to be short when the rent comes due this month. On the other hand, I’m definitely not using my newfound savings on my apartment. I’m using it to buy bananas and ham sandwiches. I guess you can make up your own mind what you’d call that.